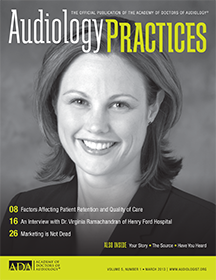 Audiology Practices is the official publication of the Academy of Doctors of Audiology (ADA). Access to the print and web editions is offered as a member benefit. For more information on ADA membership, click here. If you are not eligible for membership in ADA but would still like to access Audiology Practices, ADA offers a convenient resource subscription for those who will benefit from access to the resources available on the ADA/AP websites and through ADA’s reimbursement resource, Dr. Kim Cavitt. The $50 annual subscription is ideal for practice managers, industry representatives and billing and coding professionals who would like ongoing access to ADA’s library of resources and up-to-date association news. Sign up for your subscription today! Please Note: The ADA Website Subscription is available for non-audiologists, office personnel and industry partners. The subscription should be purchased in the name of the subscriber not that of an audiologist, practice or company. The subscription provides access to the ADA website, Audiology Practices magazine and full access to the AP website, and consulting services provided by Kimberly Cavitt, Au.D. Audiology Resources, Inc.